PRIMUS bassist/vocalist Les Claypool says that his band will support SLAYER on the thrash metal veterans "very last" U.S. tour. Claypool broke the news of the PRIMUS-SLAYER pairing during an appearance Thursday (March 21) on "Bill Burr's Thursday Afternoon Monday Morning Podcast". He said (around 50-minute mark in SoundCloud widget below): "There's another thing too that's kind of a secret, but maybe I can tell you now… So it looks like we're confirmed — we're gonna play the last, the very last run supporting SLAYER's very last tour; PRIMUS is… It's starting at Madison Square Garden [in New York City] and ending at The Forum [in Los Angeles]. That's the rumor." PRIMUS has been touring in support of its ninth studio album, "The Desaturating Seven", which came out in 2017. 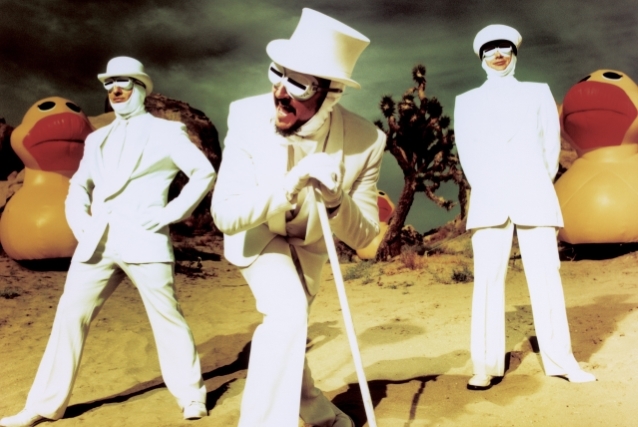 The LP marked the return of the definitive PRIMUS lineup — Claypool, guitarist Larry "Ler" LaLonde and drummer Tim "Herb" Alexander — for its first album of original music since 1995. SLAYER's final world tour has consisted of two North American legs and one European run. The band will take its final world tour to South America, Australia and Japan this year. The next North American leg of SLAYER's final tour will take place later this spring. LAMB OF GOD, AMON AMARTH and CANNIBAL CORPSE will support the 16 dates in May.